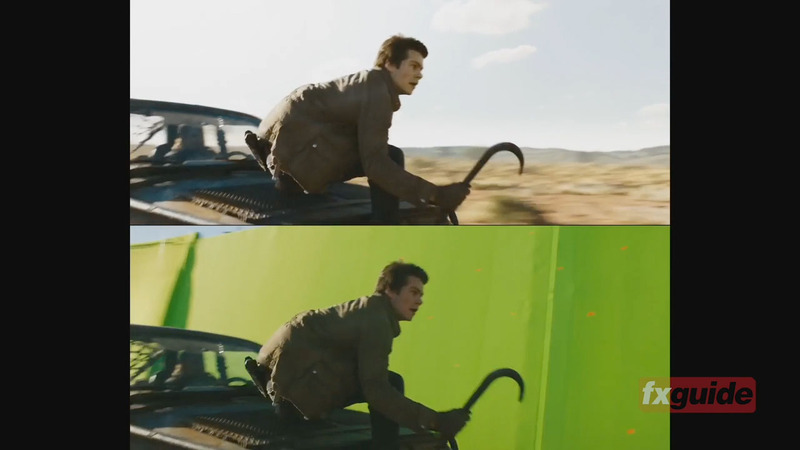 Maze Runner Exclusive video breakdowns with Wes Ball. 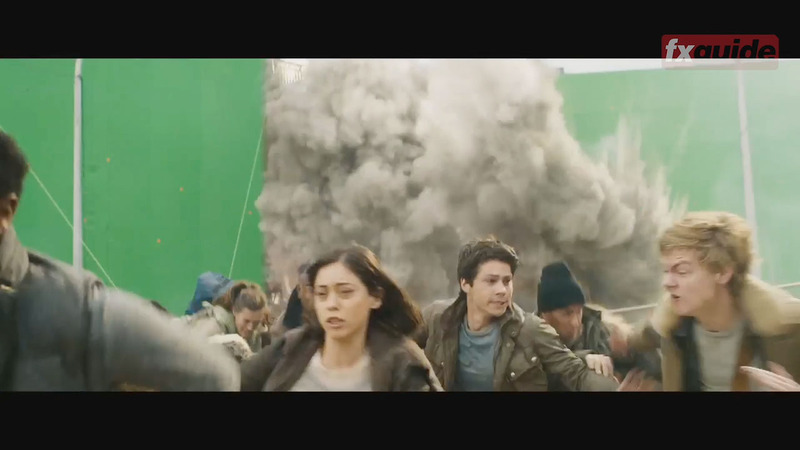 In the epic final film in the Maze Runner saga, Director Wes Ball, worked again with Weta Digital to bring the film to life. In The Death Cure, Thomas leads his group of escaped Gladers on their final and most dangerous mission yet. To save their friends, they must break into the legendary Last City, a WCKD-controlled labyrinth that may turn out to be the deadliest maze of all.The film has proven to be a hit with fans and film goers alike. Weta Digital was required to do a range of visual effects from complex set and environment work, to digital makeup and complex compositing. Below are three exclusive clips showing the VFX work from Weta Digital. You can listen to the entire interview here between fxguide's Mike Seymour and Director Wes Ball. In the clips below Wes Ball explains three important aspects of the film. The Opening Train Action Sequence. Filmed in South Africa, the opening WCKD train heist sequence appears to cover a lot of open country, although in reality, the train was stationary and all the environments were added with visual effects. As you can hear, Ball decided to shoot outside to get the most accurate lighting, but enormous amounts of the frame then needed to be replaced around the actors. While the production shot the green screen outside, the nature of filming meant that the sun moved a lot during the day, resulting in some shots being filmed closer to mid day while others were 10 mins from sunset. All of these plates were balanced and adjusted to cut seamlessly together. A small vfx unit traveled north to the Kalahari desert to collect thousands of images, lidar scans and drone footage as reference for Weta's environment team. The reference vfx team covered a 5km section of track and that was handed over to Weta before principle photography, so a test could be made before the green screen shoot in South Africa. In the film, actor Walton Goggins plays Lawrence, an already infected individual. The budget was initially thought to not extend to doing a full digital nose removal, but as things changed Weta Digital stepped up to the task. 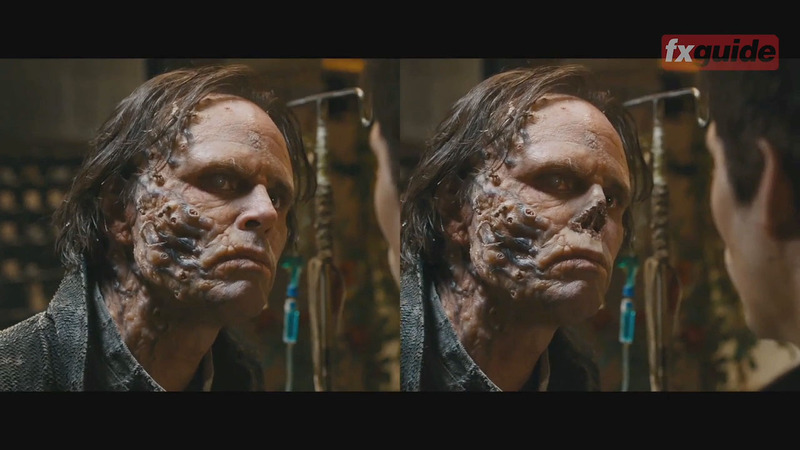 Without the use of tracking markers or special reference photography, Weta managed to digitally alter the actor's face in keeping with the original intent from the books the films are based on. Matt Sloan (The Martian, X-men Apocalypse) was the overall visual effects supervisor and Chris White (Valerian and the City of a Thousand Planets and Maze Runner: The Scorch Trials) led the team at Weta Digital as their VFX sup. "Wes wanted a really big feel to the city, and how big it was in comparison to everything we'd seen before," commented Sloan. For Weta Digital this meant a vast amount of assets, especially for the WCKD city which would be seen both in high sun and at night. "One thing we did was build the whole city, right down to the slum areas, and one of the nice advancements with this film is we also built all their interiors, as we knew there would be a lot of night shots. So instead of just having a still inside a building room, we had actual 3D tables, chairs, door knobs - you name it. So in terms of scope, it was basically building and dressing that entire area and I think that added a lot to how big it felt," explains White. The team used extensive instancing and then leveraging that in their Manuka renderer. For example with the slum areas outside the city gates, the team initially just started with dressing a few city blocks with burnt out cars etc and then from there instanced. However White felt it was important that Weta build from "hand dressing of the set, out, to get the right feel for it". To get an insight into the attention to detail, Sloan points out that even the glass on the buildings, the windows of the apartments and offices, is not flat "just to get the light and refractions to look right. All the windows have their own individual textures and warps to effect individually their reflections. It was this detail, the tiny dirt, the way the lens was built with correct bokeh - it is just very hard to read scale when everything is clean and perfect," he adds. "Weta did a great job adding all the detail that maybe you don't individually see but it all adds up to a believable result". Weta Digital has an advanced renderer, and perhaps because of this, even when lights of the city were going to be defocused, attention was paid to the source lighting. For example, on one of the buildings it was designed with strip LED lights running vertically. "We made sure that the LED strips had tiny variation so that when they were seen through the bokeh, you would see and feel the variation in luminance, otherside it would have been just a straight decosued flat line," explains White. The team used Weta's new Physlight process for physically matching the real light in CG (fxguide has a story coming out next week on the Weta's Physlight). A vast amount of digital environments and city work was created by Weta, but the film over all was not a huge mega budget blockbuster. Below Wes Ball explains how he used real and virtual cinematography to make the film seem more cinematic and add a decided open feel to the film. There was a lot of explosions and fires added to the city by Weta's sim team. "We definitely had to model all the interior structures of all those buildings and mapping out where those particular building would be hit... and then there were specific models to be broken apart and simmed," comments White. Weta again tried adding as much dressing to the buildings as actual CG geometry to help scale the explosions and make them as real as possible. As the filming was primarily in Cape Town in South Africa, the team did not have a lot of real high rise structures to work with. "A lot of the time we kept the actors on easy set pieces where it was easy to extend the set pieces, so there was not a great deal of green screen used in the city," commented Sloan. "The way we did the layout with the location in Cape Town - if you could overlay them, the layout matches almost perfectly with the WCKD City... we stuck with that and it was a great way to do it as you knew there would be consistency of shots and shot direction, we weren't just art directing each shot in isolation". In the end the final count was 970 shots. Wes Ball comes from visual effects (in fact he has taught at fxphd), and his visual effects background was not lost on his visual effects supervisor Matt Sloan, who finished by saying that, "it was amazing to have a director who was as engaged and savy as Wes." Actually the director did do three shots himself, (as you can hear in the full podcast interview), "he wanted to do it because, I think, he thought it was easier than trying to explain it - and besides then he could say he did some shots!"